The migrants had been aboard a large fishing boat when the Italian and Maltese coast guard began squabbling over who was responsible for taking them in. 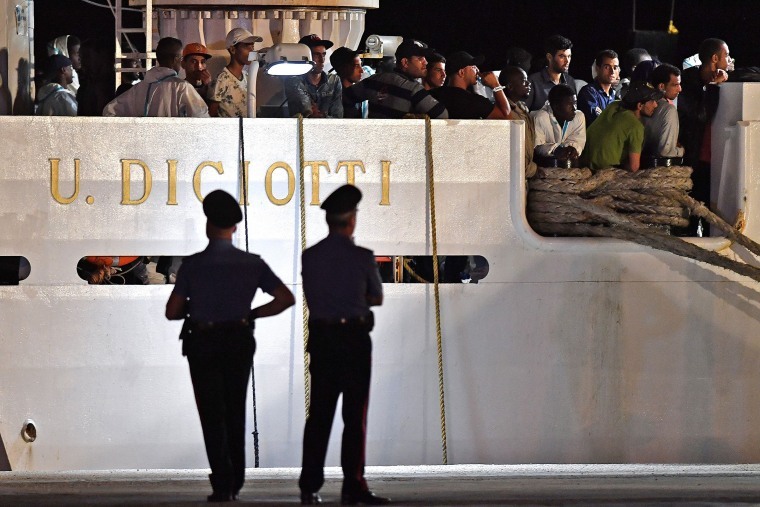 ROME — Two border patrol ships carrying 451 migrants neared Sicily on Saturday but the migrants' fate remained uncertain after Italy's hard-line interior minister insisted they should be sent to Malta or Libya instead. Italian Premier Giuseppe Conte's office said three ideas were being considered: Redistributing the migrants among European countries, contacting Libyan authorities to arrange for their return, or keeping them on board the ships to screen them for asylum. Interior Minister Matteo Salvini, who has forced migration to the top of Europe's agenda by refusing to let rescue boats dock at Italian ports, vowed to remain firm Saturday as he created yet another standoff. Early Saturday, the migrants were taken off the boat and transferred onto a rescue vessel from the EU border patrol agency Frontex and a ship from the Italian border police. By late Saturday, the two ships were near the Sicilian port of Pozzallo. In just one month in office, Salvini has upended years of Italian policy toward migrants by refusing them entry.